Arriving a few days ago in this wealthy city-state at the southern tip of the Malaysian peninsula in order to attend the third Singapore Biennale, I wondered what type of contemporary arts could thrive in a city whose well-earned reputation is one of fabricated perfection and paternal government control. Could unvarnished intellectual explorations into political and economic realities of modern life flower in an environment of unchallenged censorship and consciously affected good behavior? 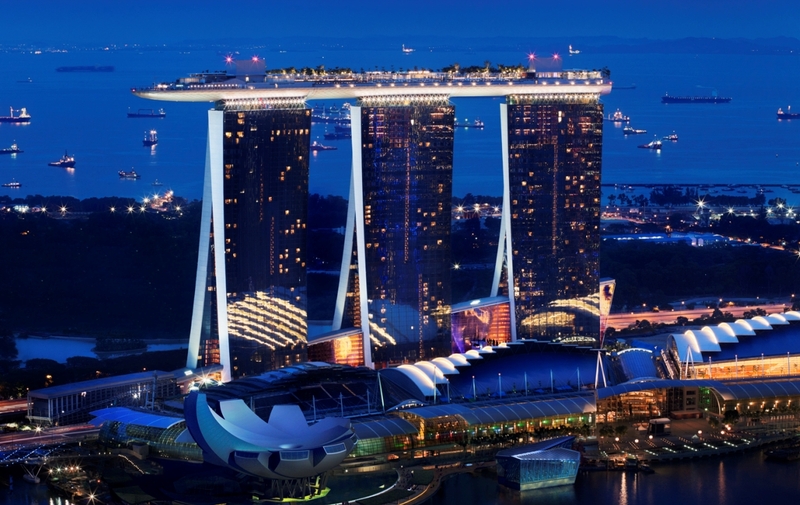 Singapore is a truly impressive place, utterly unlike any other metropolises in south-east Asia, and exhibiting uncanny similarities to a well-ordered Nordic urban environment. All of the cars driving the impeccably tidy and well-organised streets appear to be less than five years old and the brands displayed reflect a very wealthy economy. The many new glass towers and architecturally daring institutional buildings boast an impressive design bravado, particularly the new triple-towered Marina Bay Sands with its capping bridge structure that resembles a massive Noah’s Ark, had that biblical superhero intended his craft to be a sleekly modern gambling vessel tricked out with a 150m infinity pool. The city’s planners clearly studied their urban planning textbooks with the utmost attention before implementing a balanced system of transportation networks and public spaces. The whole built situation is startlingly harmonious, a total reboot of the contemporary urban environment. Version 2.0 of the modern city. Even its Chinatown is orderly and clean. But in its perfection, Singapore is missing something massive, and everyone I spoke to, both locals and visitors, discuss it frequently. While tipping the scale towards comfort and safety, the city has misplaced its edge, creativity and serendipity. In five days I have not seen a single police car nor a uniformed officer and, amazingly for a city of five million souls, not a single siren sound has touched my ears. This is particularly unexpected for a place with a series of civic rules so all-encompassing as to prevent even simple acts like the spitting of gum (stores do not even sell the substance). The government is involved in the development of the arts and culture of this small country as actively as it is in all other aspects of Singaporean life, and the Singapore Biennale is its attempt to fertilise not only the nascent native contemporary art scene but also this nation’s position as the leader of new visual arts for the entire south-east Asia region. In our current tumultuous era, the official theme of the biennale, “Open House”, is rather disappointing and neutered, seemingly fearful of inspiring any real dialogue or providing opportunities for government disapproval. Luckily, however, after close review of the impressive scope of works in the festival, it is evident that this theme has been largely ignored by the artists presented. Though the result is a hodgepodge of works lacking in any central theme or critical focus, many of the pieces presented in the Biennale are very strong and Singapore’s role as a positive incubator of an art form that is still relatively new to the region must be acknowledged. The works by North American and European artists included in the Biennale are clearly among the best pieces in the event: videos by Charlie White, Tracey Moffatt and Candice Breitz are obvious standouts and display these artists’ expert facility with humour, editing and insightful cultural investigation. But works by many of the Southeast Asian artists included the Biennale also compare very favourably, with Vietnam, Thailand and the Philippines showing evidence of particularly strong national contemporary art scenes. Tiffany Chung’s delicately crafted and brilliantly installed sculptures, which riff on the sweeping effects of recent urbanisation and consumer culture growth in her home of Ho Chi Minh City, offer thoughtful meditations on the importance of developing alternative modes of sustainable design for the Mekong Delta. Navin Rawanchaikul’s exploration of Indian heritage and immigrant multiculturalism in Chiang Mai was offered through a sensitive and engaging installation including video testaments, written accounts of the dynamic difficulties faced by those leaving home, and an impressive multi-person portrait painting of the diverse community around the Kad Luang market, a regional trading hub for migrants in that part of northern Thailand. Louie Corderdo, meanwhile, offers a gruesome yet hilarious and cleverly executed installation including paintings, fibreglass sculptures and a karaoke machine that exhibit comic-book horror-kitsch aesthetics. This work recreates a slice of true violence in Cordero’s hometown of Manila where a recent spate of bloody fights have ensued every time Frank Sinatra’s “My Way” is sung in karaoke bars. These real-life events have frequently ended in dismemberment and bloody death and this work offers a salient metaphor for a struggling nation experiencing the flipside of Singapore’s fortune. Unfortunately, few of the interesting works in the Biennale offered meaningful insight into the host city itself. Perhaps the artists invited to participate were concerned about government censors who exert intimidation from invisible shadows. Or maybe they avoided using the city-state as a subject matter because, unlike their own nations, Singapore does not have major social and civil problems worth exploring. What is certain is that the National Arts Council and the Singapore Art Museum (the government institutions supporting this worthwhile event) have succeeded in providing a nutrient-rich growth medium to advocate for the value of visual culture and provide an enhanced and much-needed base for fresh shoots of contemporary art to take hold in this region. By Randy Gladman and originally published in The Financial Times of London's HowToSpendIt.com, March 30, 2011.